I always knew I wanted to work in health, but it was the close bonds that I formed with my patients that made me want to become a physiotherapist. I grew up in Canada, where I did my bachelor’s degree in biomedical science. Back then, I still wasn’t sure whether to go into health or physiotherapy. However, I did realise that I definitely didn’t want to be working in a lab for the rest of my life after my experience studying chemistry. To get a taste of all my options, I volunteered in medicine, physiotherapy and pharmacy departments. Of the three, physiotherapy stuck out to me due to the amount of time we got to spend one-on-one wit- patients. As a people person, being able to stay with the same patients long term, develop a rapport with them and witness first hand the difference our treatments could make in their life was hugely inspiring for me. With my direction decided, I applied for my Masters in Physiotherapy from McMaster University in Hamilton, Canada. 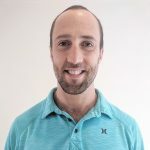 Fast-forward past many years working in sports clinics in Toronto, and my girlfriend and I decided to move to London, where I joined Physio London. I couldn’t be happier to find myself in a clinic that values a patient-tailored approach as much as I do. Spending time with our patients, getting to know them and following their progress is by far the most rewarding aspect of physiotherapy. Of all the treatment tools that I’ve learned over the years, by far the most valuable is education. Taking the time to educate a patient rather than just prescribing them a treatment and showing them the door results in both a more successful rehabilitation and better long-term health. If you understand how your body works and why our treatment is effective, you’re more likely to appreciate the value of the treatment and continue doing it than if you were kept in the dark. Education also empowers you to be able to care of yourself more effectively. When you know how your physical conditions have developed, you know what changes you can make to avoid them and recognise the warning signs that they’re flaring up again. Instead of having to visit the doctor every time you’re in pain, you can apply what we’ve taught you – from small lifestyle changes to prescribed exercises – so that you can resolve your problem independently. Then, if you’re still not making progress, you can get in touch with us at enquiries@physiolondon.co.uk and we will ensure you get a specific diagnosis the appropriate treatment to ensure you achieve a full recovery.